So what do you do when you go on an international vacation? Build a new Optimist Club of course! Norm and Liz Sagen who recently spent a well-deserved vacation reported that they assisted with the building of the first Optimist club in Bali, Indonesia. Norm and Liz Sagen are Builders of Excellence for chartering the Optimist Club of Denpasar in Bali, Indonesia to support a local orphanage. The Charter President is Ni Huh Putu Suartini and they signed 42 members. OI will recognize this as a club project of the Davidson club. Congratulations! It is with a heavy heart that I pass on the news that Myrna Sieben passed away last Thursday night due to a brain tumor. Mryna was a true Optimist, always active at the club and district level, and serving this year as our District Bulletin Editor and Publicity Chair. 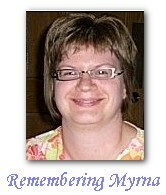 Myrna greeted you with a smile and friendly word each time you saw her. She brightened your day, just the same as she did for every child she helped. A prayer service was held at 7:00 pm Tuesday at the Catholic church in Unity. Funeral services will be Wednesday at 10:30 am in Unity, Sask. I am pleased to announce that a revised District Directory and Darryl's Team Contact Card are now available for download. Please review the contact information for yourself and your club and email me the revisions. In addition, we are asking for submissions for changes to District Policies that are published in the District Directory. Please submit your recommended changes to Gov Darryl or DST Patti. 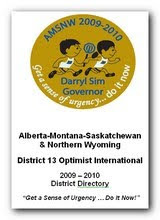 You are invited to the 3rd Quarter District Conference scheduled for May 14-15, 2010 at the "Sheraton Cavalier Saskatoon" in Saskatoon, Saskatchewan. The District Oratorical Contest will be held on Saturday, May 15th. Accommodations are in limited supply, so you are urged to book your rooms as soon as possible. Room rate and availability is guaranteed until April 14th, but book soon just to be sure. Call the Sheraton Cavalier Saskatoon reservation number at 1-800-325-3535.